There are some very specific issues related to men's big rings that need to be understood, let's take an example of a size 15 ring. Most rings for men are ordered in the size 9 to size 11 range, a large ring would be above 11. Most jewelers define standard features for a ring including, metal weight and gem size. These specifications remain the same irrespective of the ring size. This interestingly is the WRONG way to configure a ring, one glaring issue is that. A men's size 8 ring and the same ring in size 15, cannot have the same metal weight. To simplify the explanation, the larger ring would have lower metal thickness - something like stretching a size 8 ring to a much bigger size ring. In this report we talk about various features that would be relevant to a big men's ring. It really is not just about metal weight. An awesome design for a large ring, the center gem is a 9x7mm gemstone of your choice. The row of diamonds around the center gem gives the ring an impressive head height. 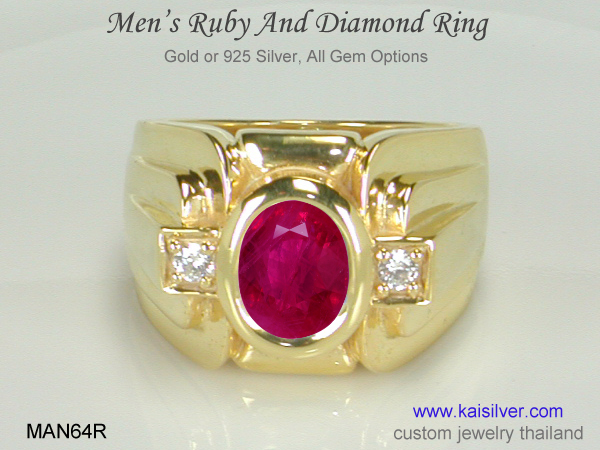 Concept is perfect for a men's size 15 ring with an expensive gem like ruby or sapphire ... more. Yes a heart ring for a man, the claddagh ring a 4 century old ring. This is a very meaningful ring and is considered to be the most meaningful jewel in history. A 9mm heart shaped gem, with a crown on top. A great choice for rings of all sizes check the details ... more. 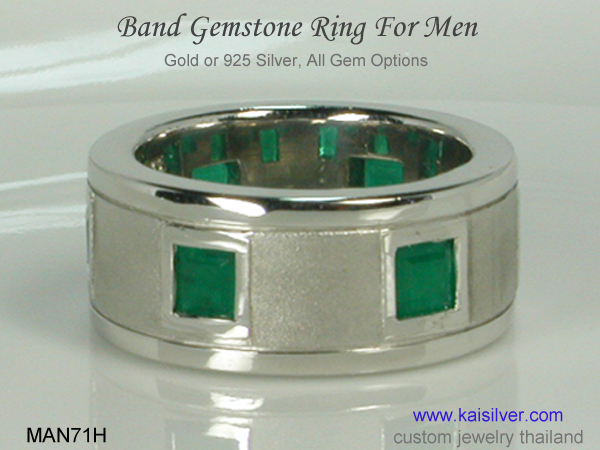 Men's gemstone rings are awfully popular and this, applies to rings of all sizes. 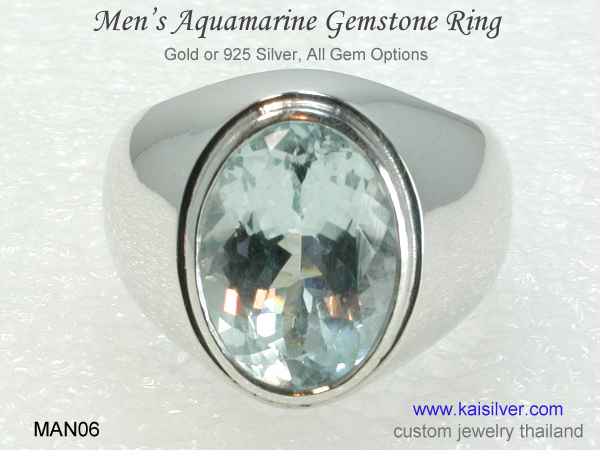 When you talk about men's size 15 gemstone rings, the price structure of the gemstone takes importance. Most of us are aware that gemstones are priced per carat (weight unit). What is not very well understood is that, the per carat price of a gem shifts up as the size of the piece increases. Another basic fact is that, different gem types are priced differently, and this price variation can be significant. A big ring would generally have a larger gemstone, you already know that the larger size comes with a premium price tag. As an example, size 8 ring with a 6mm round gem might look just fine but, the same gemstone size on a size 14 or 15 ring, might appear quite small. If you wish to shift to a large sapphire gem size of around 9mm, the ring might move beyond your budget. One option would be to choose different gem, you could probably pick a blue topaz gem instead of a sapphire. If you wish to wear a large ring with subtle amount of glitter and bling, the MAN64R is just right for you. This is a custom ring so you could request for a size 12, 13, 15 or any other size. The center gem could range from 9x7mm to 10x8mm, check out the report ... more. For those of you who wish to go solo, nothing but the sparkling gem in the center. Presuming that you wish to wear a ring size 15, the gem would ideally be in the 11x9mm to 12x10mm range. Probably too large for rubies and sapphires, fine for other gems ... more. Why do we hear that, big rings show a drop in long term durability. While this might be true, it is an entirely human created problem and is avoidable. Men in general take far care of their jewelry as compared to women, this is something that men's rings will need to address during the design and crafting process. At Kaisilver, we assign the metal weight to a jewel based on the dimensions and size of the piece. So when you wish to wear a big ring with a size of around 15, what is an optimum metal weight. It is true that the weight would depend on the ring design and dimensions but, here is an awesome tip. A men's size 15 ring should ideally have a minimum metal weight of around 25 grams. You should take a close look at a big ring that has a lower weight. Diamonds in sizes beyond 3mm show a steep price rise, what if you require a size 15 diamond ring. The RG180 is an innovative concept, pile diamonds in the 3mm to 4mm size range and increase the width of the band. The diamonds could be round or square ... more. 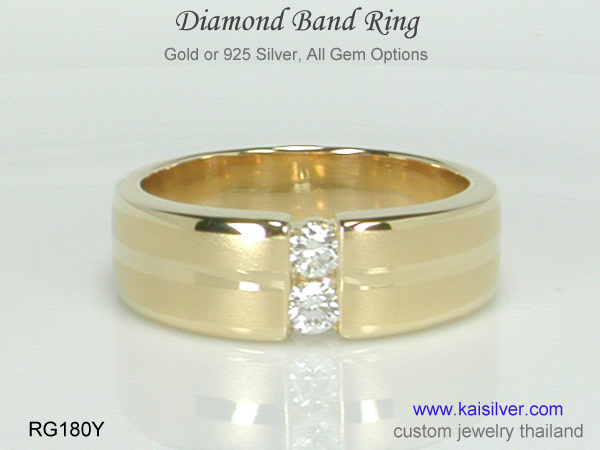 A men's size 15 band ring would ideally have a band width of around 9mm to 10mm (1cm). We have designed the MAN71 to match those specifications. You could order this big band ring with no gems, or decide to mix different gems in the same ring ... more. If you look at a ring closely, you could find that the inside of the band has some metal scooped out. This is generally more common with gold rings. 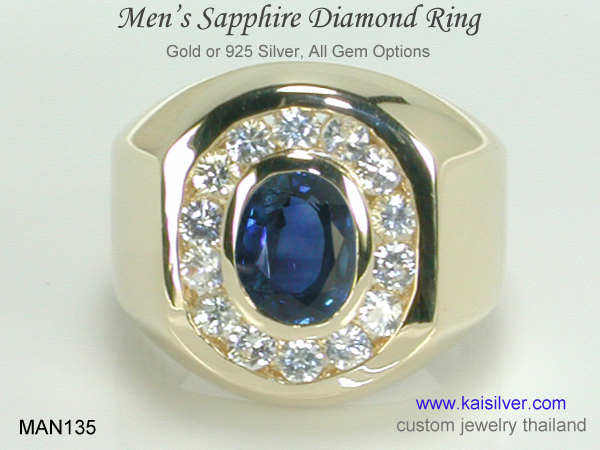 When you order a ring at Kai Silver, you can specify whether you would accept a ring with a metal scooping done inside. Depending on the ring size, a ring with no scooping done inside could require additional metal weight. A large size 15 ring would call for additional weight with or without scooping. The advantage of choosing a custom ring is that, every single feature can be tuned to the dimensions of the jewel. Rings that are not scooped, are more comfortable to wear and also have a more valuable appeal. At Kaisilver we take a decision based on each individual case. Choose Custom Made: While all custom jewelry providers are not the same, we would like to highlight the reasons why a custom made large ring from Kaisilver is a great choice. We place no restriction on your choice of design or gemstones. Your size 15 ring can be made with a design provided by you. The minimum metal weight of a big ring with size 15 would be 25 grams. The actual metal weight will be optimized based on the ring size and dimensions. We procure all gems from miners and custom cut them, no middlemen are involved. A big gold or 925 silver ring will have the same quality standards. A big ring in gold can be ordered in 14k or 18k white, yellow or pink gold. Let us know if you need the ring to be made with no scooping inside the band. Bezel setting for the main gem is the most secure and we recommend that. Kaisilver: Widely regarded as the world's leading online provider of high end custom jewelry, we are honored to have around 7,000 satisfied clients spread across 12 nations. We handle the entire production process right from the design stage to the final quality checks. Our gem experts closely inspect every piece of gemstone that we use, highly skilled gem artisans cut every gem to perfection. Your gemstone choice is not limited to what you see on our websites, we can procure and custom cut just about any gem from any part of the globe. 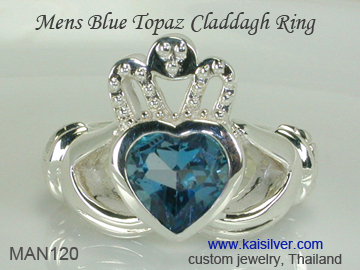 We can craft your size 15 men's ring based on our design or work with a concept provided by you. Get in touch with our team of experts at sales@kaisilver.com with any queries related to gems and jewelry that you might have. I just received my ring and I had to send you a note of thanks. It is as beautiful as I expected it would be. Your patience with my questions was always gracious and the answers prompt and courteous. Please extend my thanks to the entire company and the artists who created this piece of art during extremely trying times for you. Feel free to use my endorsement of your company on your website, and I will be sure to tell everyone about your company. Thank you and God bless all of you ... Lynn St. Martin .... more.